Menschen reisen um die Welt, um die geheimnisvollen Wirbel zu erleben, die von Sedonas roten Felsen ausgehen. Die Sedona-Wirbel sind wirbelnde Energiezentren, in denen die Erde besonders lebendig ist. Erleben Sie diese kosmischen Kräfte auf einer landschaftlich reizvollen Jeeptour mit einem professionellen Guide. Genießen Sie malerische Ausblicke und einheimische Flora und Fauna. Spüre den unglaublichen Geist von Sedona. This tour only has 2 reviews on here 1 good and one not so good. There are some far more positive ones on Trip advisor I really enjoyed this. Dominic was an excellent guide and we also had Buffalo a Native American on ride along who contributed to the overall experience. Dominic was very good. A lot of the problem with this tour was the guide. Our tour was on May 14th and I don't recall his name. 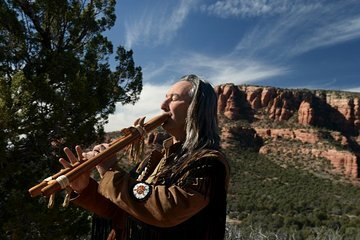 He spent a ton of time talking about a third eye, visions, problems in his personal life resolved via spiritualism, his Apache medicine man father, playing the guitar and yoga. He was very off the wall, nice but off the wall with endless talk. His exercises were a little hokey I filmed my mom and later we couldn't believe people fell for it hook, line and sinker. It was almost comical. We wanted to know the geological reasons tied in with the vortex experience, some spiritual significance, the history and not a bunch of weird chatter. He was polite and helped my elderly mom climb up to the plateaus, but it wasn't really a effective experience. Having said that, mom and I were doubled over in laughter looking at the videos. Not to put the guy down, but it didn't seem genuine to us although it was probably very genuine to him. Kevin is a natural storyteller. Not only did he share personal tidbits, he encouraged us to tell our stories. The places were so unique and basically unaccessible to interested visitors without his guidance. His flute enhanced the magical places we visited. Worth every penny.